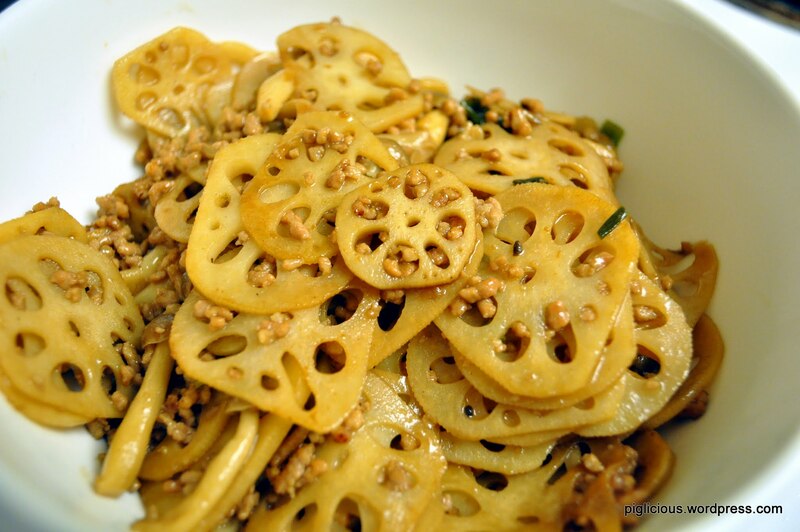 While traveling in Japan, lotus roots appeared in a lot of my dishes. As I perused my local Japanese market the other day, I saw some nice looking lotus root so I decided to buy a pack. (Experiment time! So exciting.) 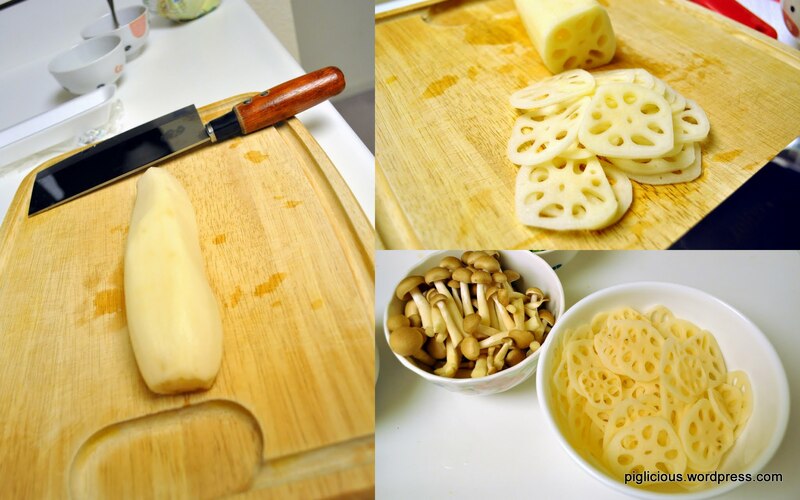 This would be my first time cooking lotus root and I wasn’t quite sure what I would cook it with, but right next to the lotus roots at the market were a variety of mushrooms. I figured mushrooms could go together with the lotus roots, sure why not, so I picked up some Japanese brown beech mushrooms (buna-shimeji). I didn’t think I would get much of a full flavor from just lotus root and mushrooms, so I also picked up some ground pork. In my head, I thought to myself that these three ingredients shall go together, and it did (luckily)–This dish turned out quite tasty! 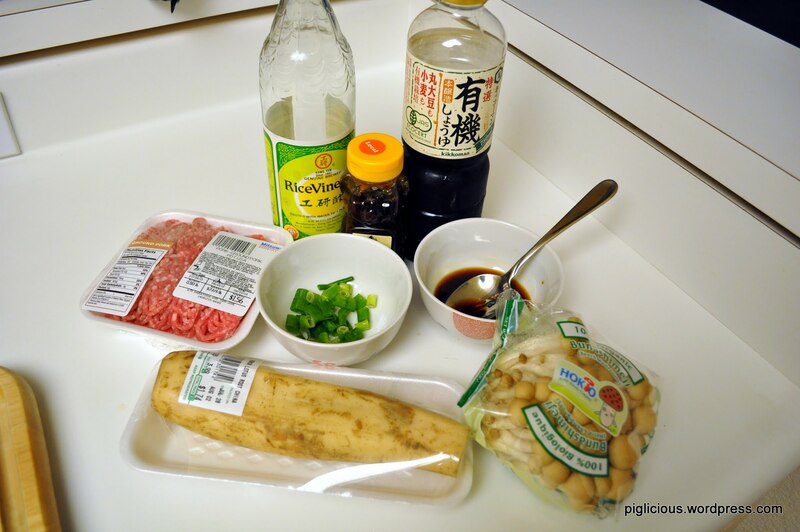 Sauce: mix honey, soy sauce, and rice vinegar in a small bowl. Make sure the honey is fully dissolved. 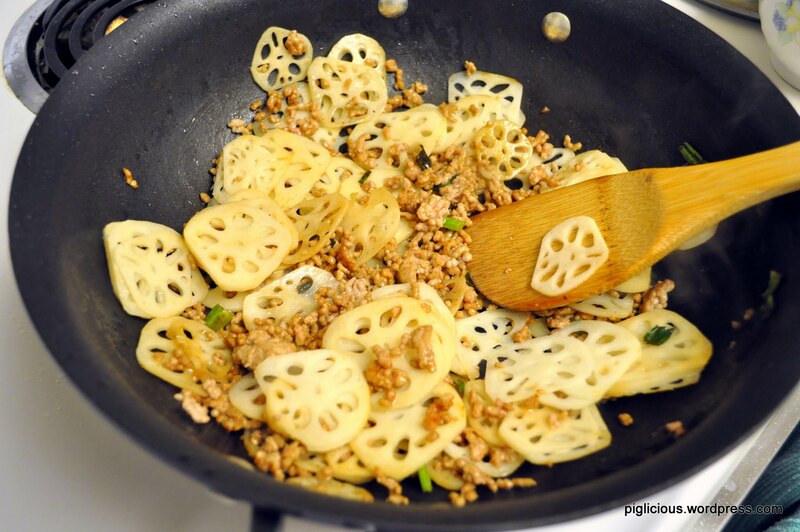 Take the lotus root and peel off the outer skin. Then slice very thin cross section pieces. For the beech mushrooms, cut off the bottom part and separate the mushrooms out. Place the pan on the stove and turn the temperature to high. Add about 1 tablespoon of oil in. Once the oil is hotter, add the green onions. 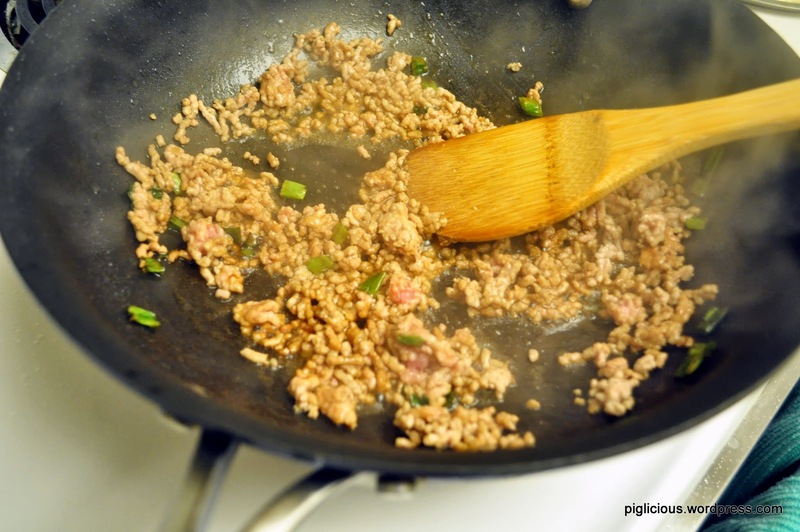 After the green onion sizzles for about 30 seconds, place the ground pork in. 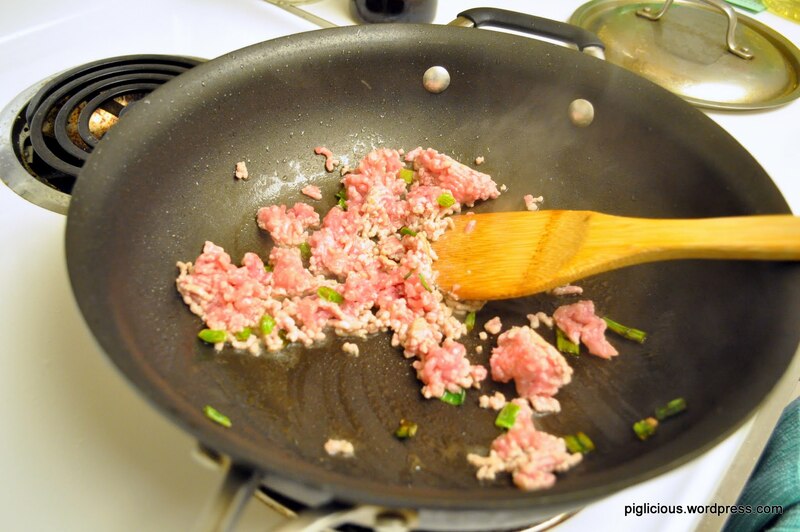 Stir and separate the ground pork out with a spatula. When the ground pork looks about 70% cooked, add in half of the sauce. Stir. 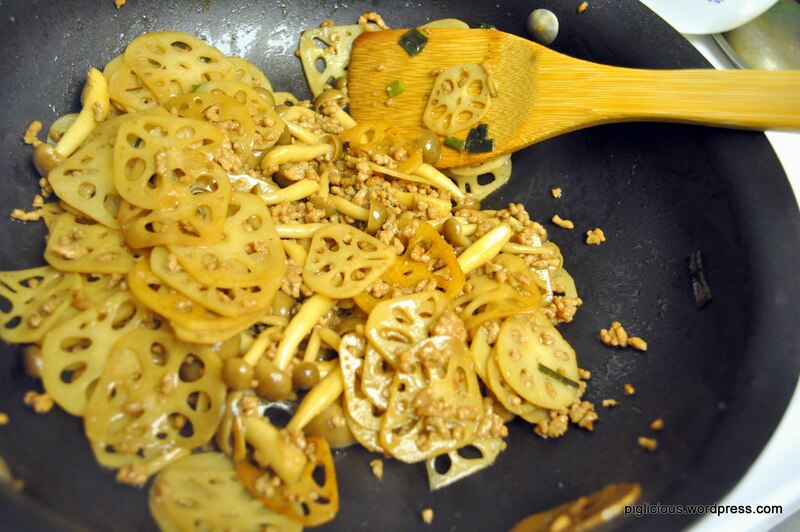 Then immediately place the lotus roots in. Stir. Place the mushrooms in. Add the rest of the sauce. Stir and mix well to evenly distribute the sauce. 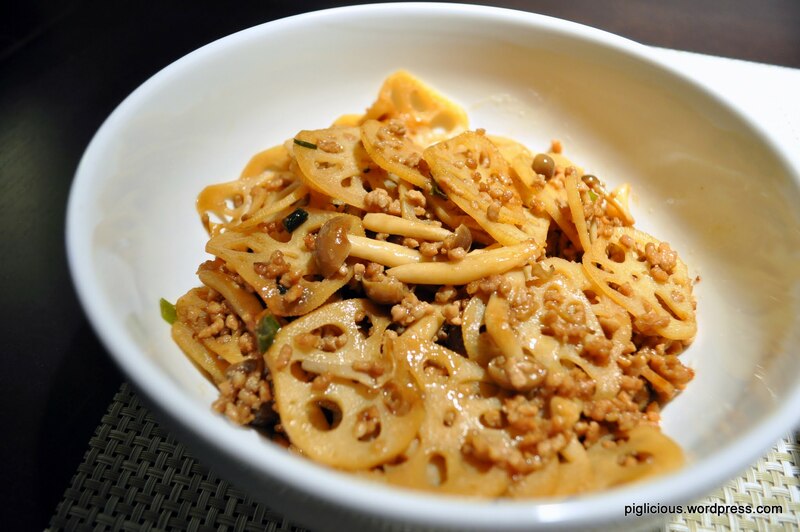 Turn the temperature to medium high and continue cooking and stirring for about 4-5 minutes, or until lotus root is slightly caramelized from the soy sauce.